Newton's first law of motion states that "An object at rest will remain at rest unless acted on by an unbalanced force. An object in motion continues in motion with the same speed and in the same direction unless acted upon by an unbalanced force." This means that an object will stay at rest or stay in motion until something (or someone) stops that constant motion. If a ball is resting on the floor (not in motion) the ball with continue to rest until an unbalanced force acts upon it. 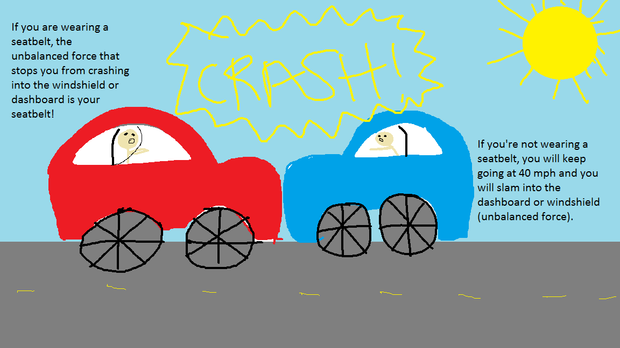 If a car is traveling at 40 mph and then crashes into another car, the objects or persons in the car will keep traveling until an unbalanced force stops them. That unbalanced can be a seatbelt, or a windshield. This is why we have to wear seatbelts. Newton's second law of motion states that "Acceleration is produced when a force acts on a mass. The greater the mass (of the object being accelerated) the greater the amount of force needed (to accelerate the object)." This means that the heavier the object is, the more force you need to move it a certain distance than the amount of force you would need to move a lighter object. 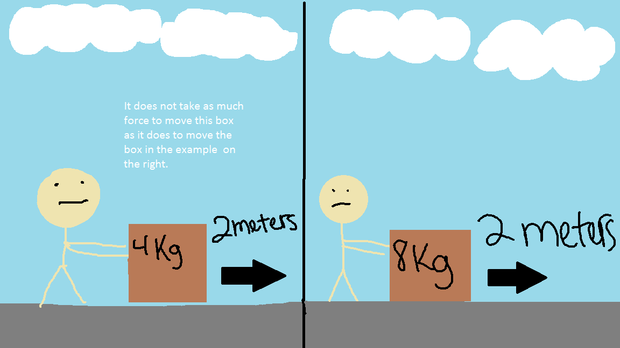 If you have box that weighs 4 kilograms and you have to move the box a distance of 2 meters and you have box that weighs 8 kilograms and you have to move it a distance of 2 meters, you would have to use more force to move the box that weighs 8 kilogram a distance of 2 meters. 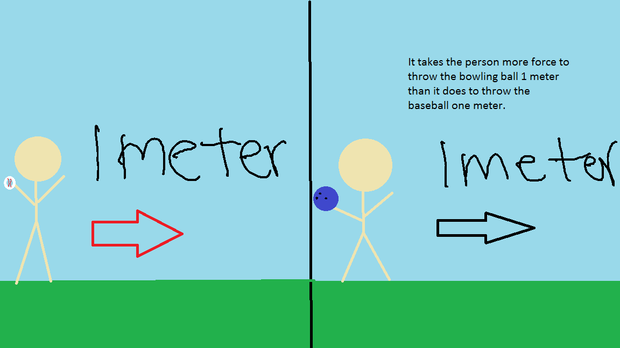 It would take more force to throw a bowling ball a distance of 1 meter than it would to throw a baseball a distance of 1 meter. Newton's third law of motion states that "For every action there is an equal and opposite re-action." This means that every force has a reaction force. The reaction force is equal to the original force but the reaction force pushes back in the opposite direction. 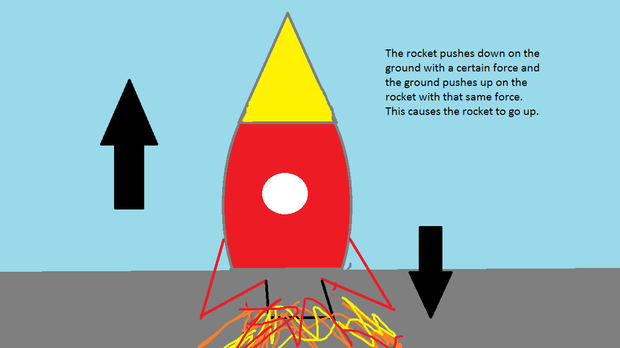 A rocket pushes down on the ground with a certain amount of force and the ground pushes back up with an equal amount of force. This makes the rocket go up. 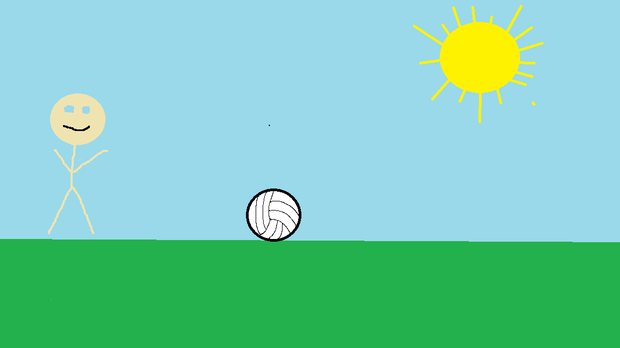 If you bounce a ball on the ground with a force of 1N the ball will bounce back up from the ground with a force of 1N. 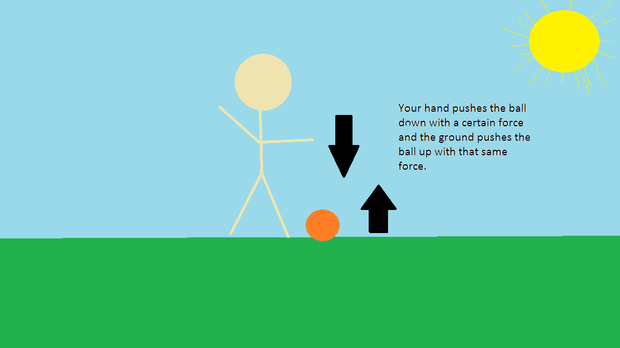 You arm pushes the ball down with a force of 1N and the ground pushes the ball up with a force of 1N.